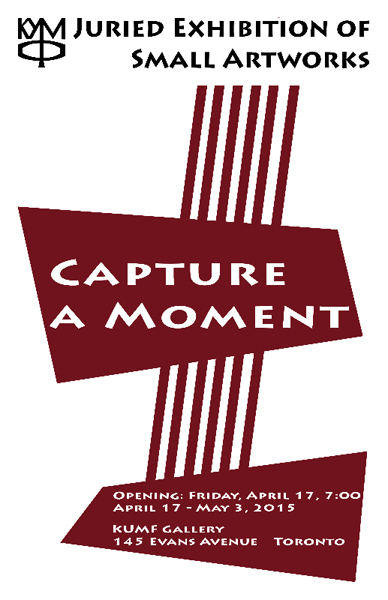 The KUMF Gallery sent out a call for contemporary artists from all across Canada to showcase their personal interpretations of “Capture a Moment”. Promising emerging, mid-career and established artists from across Canada submitted their works for selection. Artists were free to create their own vision with the only constraint being that the artwork had to be a 12” by 12”format.The submitted original art was adjudicated by professional Artist Jurors resulting in the 62 selected works featured in this show. The exhibition will take place at the gallery’s new location at 145 Evans Avenue from April 17 to May 3rd, 2015 with an opening reception and award ceremony on Friday, April 17 from 7 to 9 p.m.